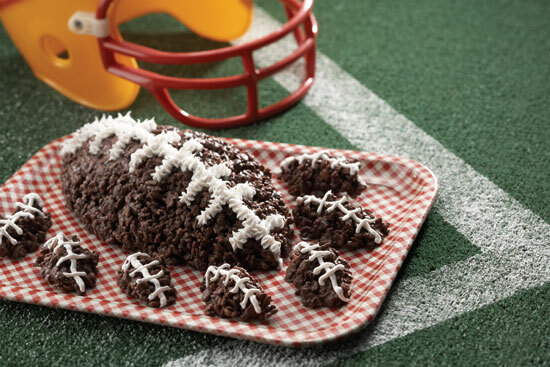 A crispy, chocolately treat that is perfect for game day! 1. Melt CANDIQUIK® Coating in Melt & Make™ Microwaveable Tray according to directions on package; set aside. 2. In a large saucepan melt butter over medium-low heat, add marshmallows and stir until completely melted. Remove from heat. 3. Combine melted CANDIQUIK® Coating with marshmallow mixture. 4. Add cereal; stir until well coated. 5. Form mixture into football shapes. Place on wax paper to dry. 6. Use white decorative icing to create laces on footballs; let set until icing is firm.